Samir always liked to give the driver a big tip. I think that was a camel not a traffic control hump you fool. 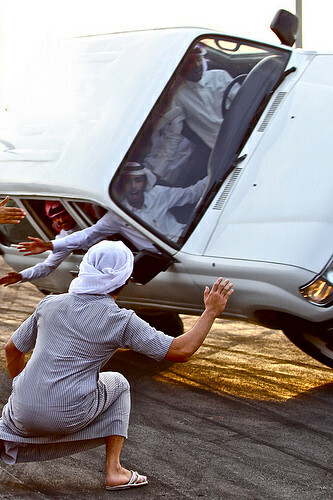 'Dubai that car?' 'No it's rented'. What kind of car is it ? They won't be laughing when the oil runs out. Kerb crawlers are inclined to meet slappers. "What are you doing Faroukh?" "Trying to catch a lift." "Harrods' sale starts in five minutes. Can't stop!" Abad Wheelie and his friends filming the latest episode of Top Fear. NO AHMED! DON'T PUSH THE CAR... That's so hazardous. You got me out of the shower for this??? Apparently it's a common Cairo practice.